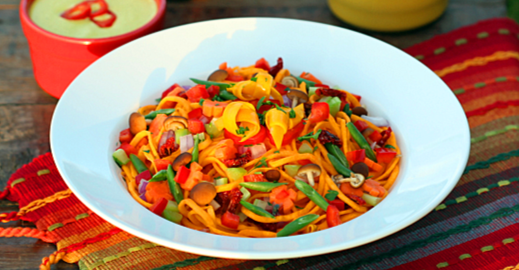 Coconut Curry Butternut Squash Noodles are plant-based with a raw vegan option. With an abundance of colorful vegetables, this low calorie dish is sure to delight the eyes, as well as the palette. It is also gluten-free, as well as Paleo-Primal Diet friendly, easy to make recipe. RAW DISH DIRECTIONS: a day ahead, slice grape tomatoes in-half dry in dehydrator or on parchment lined baking sheet in oven set to warm with door ajar. 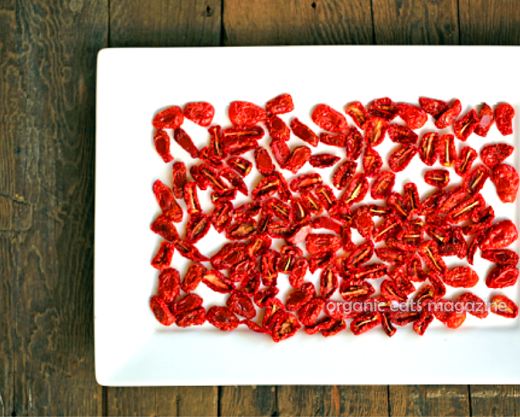 Or use packaged sun-dried tomatoes, chopped into small pieces. Peel butternut squash, use spiral slicer to make “noodles”, soak in filtered water and salt while you chop all fresh vegetables and prepare garnish. In inverted blender cup or small food processor bowl, mix coconut curry ingredients until thick and creamy. Drain squash “noodles”, arrange in pasta bowl, top with sun-dried tomatoes, chopped vegetables, and garnish. Serve with sauce on the side. OR mix sauce with “noodles” before topping or mix everything together before serving. COOKED DIRECTIONS: submerge “noodles” in boiling water, cover, and let stand for 3-5 minutes, or warm some oil in a heavy skillet or Wok and saute lightly, or use raw. Steam or lightly saute chopped vegetables. Top “noodles” with vegetables, sun-dried tomatoes, and garnish. Serve sauce on side. Or mix sauce with “noodles” then top with chopped vegetables, sun-dried tomatoes, and garnish. 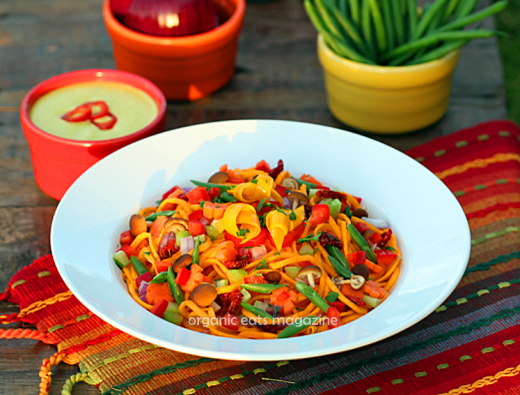 Or mix sauce with “noodles”, chopped vegetables, and sun-dried tomatoes, then top with garnish. DIRECTIONS: wash and dry ripe, organic grape, cocktail, or cherry tomatoes. Slice each tomato in half and place in a single layer on a parchment lined baking sheet. Place tomatoes on the middle rack of an oven set to warm, leaving the door ajar. Drying will take hours, depending on how large the tomatoes are and how humid the air is. Use immediately. If storing make sure all moisture is removed, to prevent mold and keep in an airtight jar in the refrigerator. NOTE: tomatoes can more easily be dried in a dehydrator, following manufactures instructions. Beneficial information and facts. Fortunate everyone I discovered your website by mistake, using this program . stunned exactly why this particular twist of fate don’t came to exist previously! I actually saved as a favorite the item.